On Disc 1, select the Options Menu. Then press "11" + "3" + "8" on your keypad. 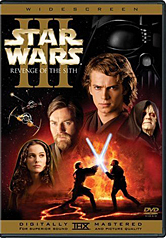 This may not be much of an easter egg, but like all of the other Star Wars DVD's, this one has three variations of the Title and Chapter Menus. To access the Menu styles, at the FBI Warning , type 1 and then the ENTER key on your remote for the Coruscant Menus, 2 and the ENTER key for the Utapau Menus, and 3 and the ENTER key for the Mustafar Menus.